Sue Bowler er en av de ledende ballonginstruktørene i verden. Hun har blogge The Very Best Balloon Blog som hun skriver på vegne av ballongprodusenten Pioneer (Qualatex ballonger). This is a highly emotive topic for the balloon industry. 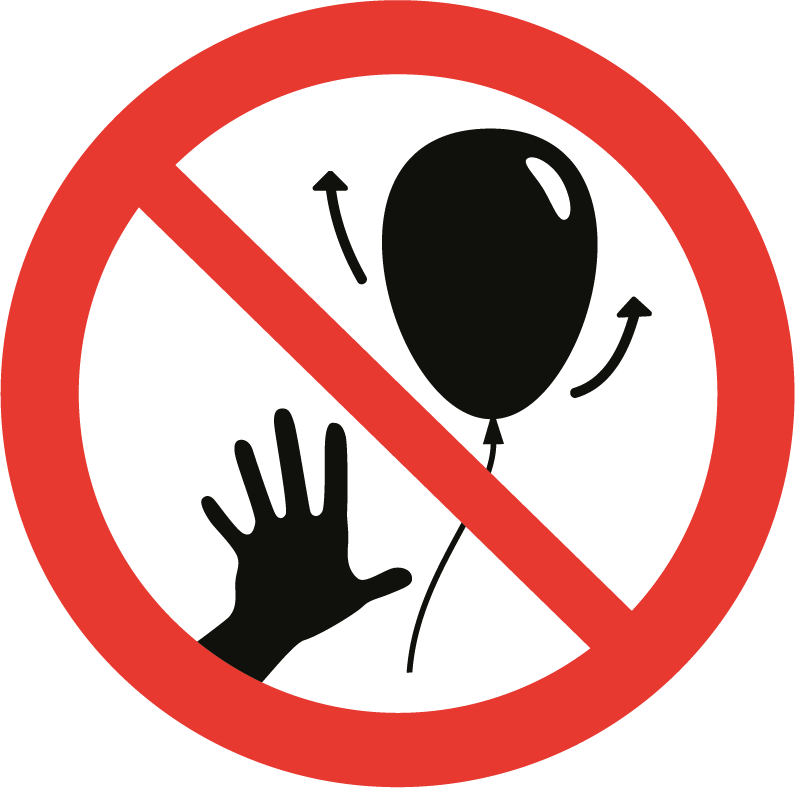 There are those balloon professionals who no longer support, or condone, nor facilitate the deliberate release of balloons into the atmosphere, and those who believe that when conducted properly, and with the right materials, latex balloon releases are harmless to wildlife and the environment. But I would like to start this post with a few thought-provoking words from Chris Adamo, CBA, of Balloons Online in Sydney, Australia. Many environmentally conscious organisations and private individuals expressed a real concern on what harmful effects latex balloon releases might have both as litter and to wildlife through ingestion. 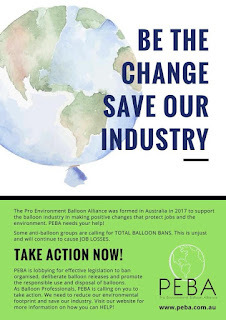 This concern has extended well beyond the environmentalists and is now one of the hot topics for governments and councils around the world, many who have already banned balloons or are calling upon balloons to be banned. Some talk about balloon releases, whilst others talk about a complete ban of balloons – this is scary! But are there any substantiated facts as to what actually happens to a latex balloon once it has been released? A recent report indicates that of those latex balloons that could be traced after a monitored balloon release, approximately 12% burst into small pieces, and 81% were recovered with half of the balloon mass intact. Another study suggests – “Wwhen a latex helium balloon reaches the low temperatures within that 5-6 mile altitude range, it will actually freeze. The elasticity of latex decreases significantly in low temperatures, so the helium balloon that was expanding suddenly becomes incredibly brittle. Every day we are seeing more and more negative reports about balloons and the environment, and yes, many of them are untrue or unsubstantiated. The problem that we have is that most people – the public – cannot distinguish between types of balloons. For them, a balloon is a balloon whether its latex, foils, or otherwise, and therefore any released “balloons” are polluting our planet. So as an industry, what can we do to change public perception? 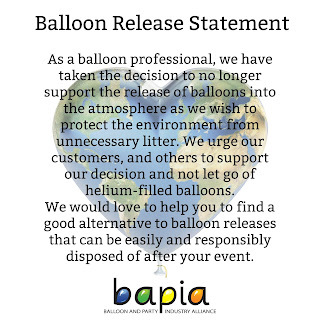 I believe like so many other balloon professionals that we need to unify as an industry and show that we are responsible and that we definitely care about the environment, and for that reason, we need to do something positive that proves it. There are several groups and organisations that are working very hard to make this happen. Members of PEBA do not support, or condone, nor will they facilitate the deliberate release of balloons. 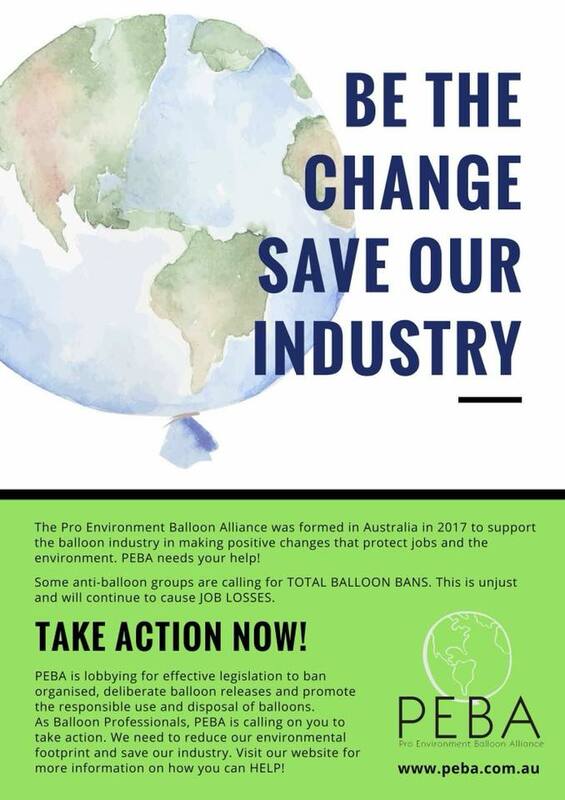 PEBA is happy to work with any authority (local, state, or federal) in supporting any legislation calling for a ban on the deliberate release of balloons. 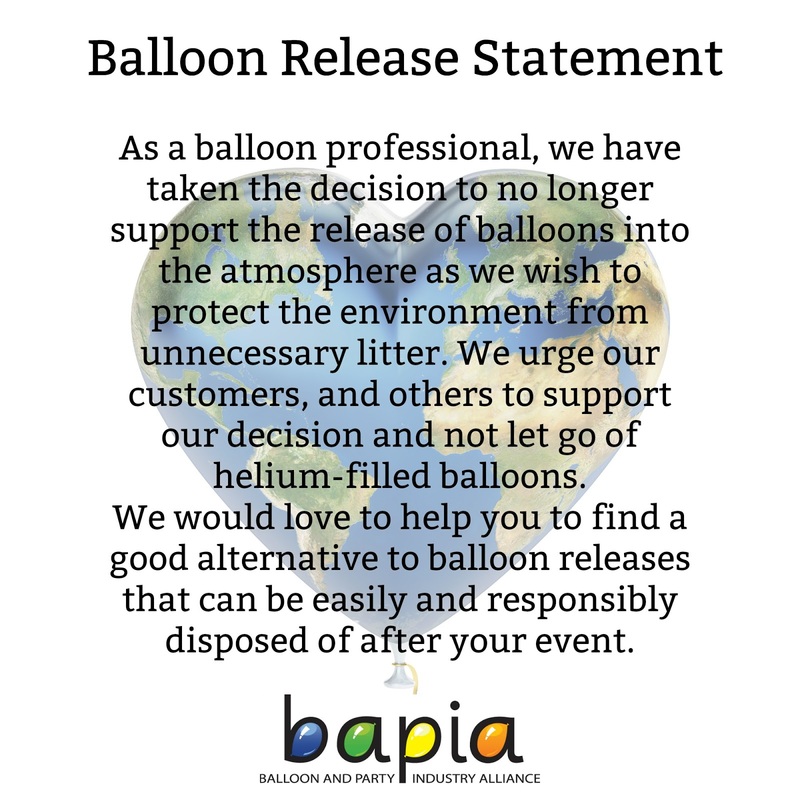 Members of PEBA will continue to educate their clients, venue managers and the general public, by all possible means, in the correct disposal of balloons and strongly support BASA’s “Pin it and Bin It” campaign. PEBA will actively promote the positive environmental aspects of balloons, while presenting a balanced view to members, the public and any authorities, on all matters pertaining to balloons and the environment. Don’t let go – we love the environment too! Balloons are a unique much-loved product and are considered irreplaceable in what they offer. Over the last few years, the industry has seen changes in consumer viewpoints and perceptions related to such products. Although these changes and increased participation have surfaced in the last few years, the rise of social media platforms and technology has enabled better reporting of such viewpoints and perceptions. To comply with the EBPC mission statement, “To educate and promote the fun use of balloons and party products safely, ethically and in respect of the environment”, and as a responsible organisation shaping our industry, we recognise the impact of our products within its marketplace. This monitoring, along with our corporate social responsibility, has led the council to pioneer new thinking within our industry on how balloons should be handled in respect of the environment, which has led to an agreement that ‘the EBPC does not support balloon releases’ as we wish to protect the environment from unnecessary litter. While latex balloon releases are visually appealing, the resulting deflated or partially inflated balloons that return to the ground is visually offensive to many, and we must respect this. This is becoming even more important as local authorities across the world are introducing penalties for balloon releases on their land or property. What’s happening in the animal world? We cannot say for sure how many animals are affected by balloon releases. There are many reports of the same instances. However, during research at EBPC in 2016, we have identified less than 6 cases since 1885 where evidence has suggested balloons to be the cause of an animal death. This was in line with the findings of research by DEFRA in 2013. Unfortunately, we have also found evidence of misleading claims and repeated instances of the same photographs, or pictures that have been doctored and used for bad publicity of balloons. To reiterate, we love the environment and wish no harm to any form of life. We are an evidence-based organisation and only work with facts. If you would like more information about anything on our website, please get in touch.